During the 10:30 a.m. Worship Service, children are invited to worship with their peers in the Children’s Chapel. Through songs, Bible study, and fellowship, kids age four to third grade continue a service of celebration, praise and fun. With a focus on the Bible, children learn about the people in the Old and New Testaments and how God used them to show His love. JDs (Jesus’ Disciples) meets Sunday evenings, 6:00p.m.—7:00p.m. Designed to grow disciples, children study theBible, learn about God’s promises, how to apply those promises to their lives and lead others to Jesus. EverySunday offers something different and fun, whether its games, a mission project, or pizza. All kids, age four to fifth grade, are invited. One week, every summer, Pittsboro Baptist Church is transformed into something entirely different - it may be undersea, outer-space, a rainforest, or a desert,dependent on the VBS theme for the year. For five mornings, kids worship, sing, create incredible crafts, and study God’s Word. 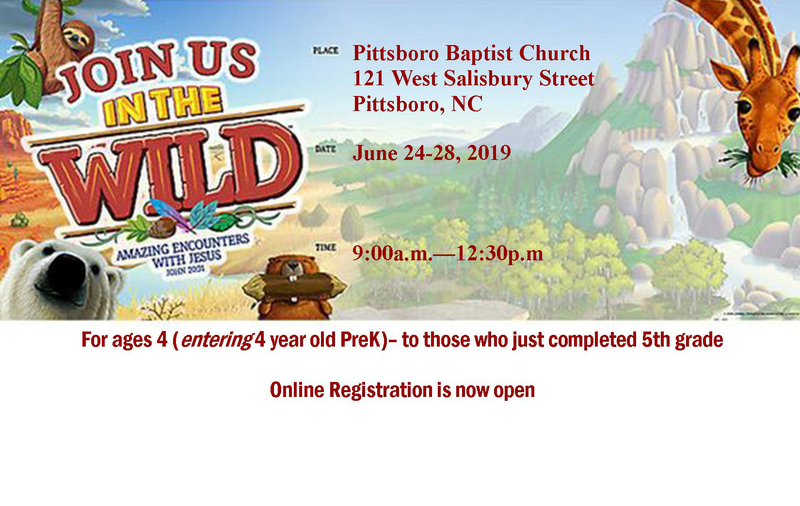 The entire Pittsboro community is invited to what has been a life-transforming event for children, age preschool to fifth grade. Our church is home to Pittsboro Baptist Preschool, a Christian based half-day preschool serving children ages one year to four. Classes are held Monday through Friday, from September through May. Pittsboro Baptist Preschool provides Biblically based, age-appropriate education for preschoolers that addresses their development cognitively, socially, emotionally, physically and spiritually. Annual enrollment is held in February, but admission is possible throughout the year, depending on availability. For more information, click Pittsboro Baptist Preschool webpage.